By stayhomecupcake on January 24th, 2013 . Filed under: Cupcake Help!, Cupcake Ideas, Kids . I f you are anything like me, you love to try new recipes but worry that recipes found are the internet may not be high quality. Never fear, All Recipes is here! 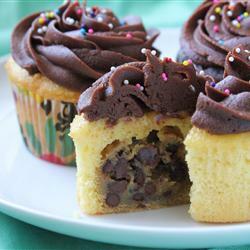 Check out this recipe for Chocolate Chip Cookie Dough Cupcakes. It has 4 1/2 stars out of 5 and has been review by 870 bakers! I love reading the reviews and seeing how some people modify the recipes for dietary concerns and taste preferences. Sounds like a good one to try out this weekend!